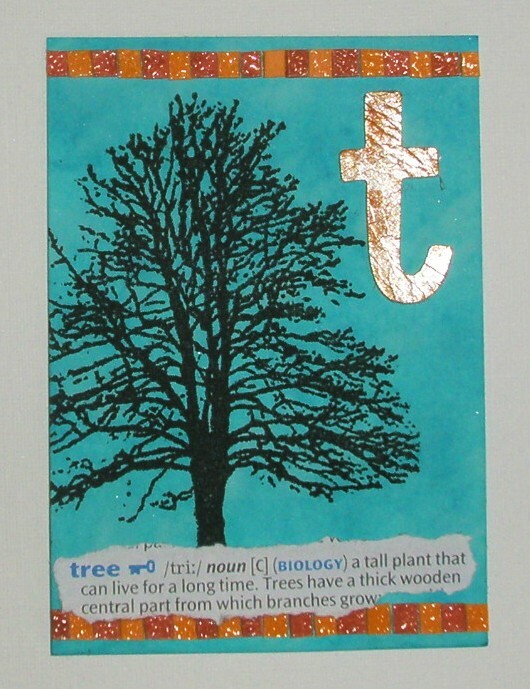 Here's my next ATC for The Craft Barn Alpha Dictionary Challenge where the letter is T. Loads of words to choose from this time but I think that makes it harder!! I've chosen TREE and three colours - Turquoise, Tangerine and Terracotta. I sprayed my ATC with a mix of Peacock Green and Jubilee Blue Ink in a Bottle (Oak House Studio) to create a Turquoise background and then stamped the Beech Tree (also Oak House Studio) in Onyx Black Versafine. I also sprayed two smaller bits of card - one with Citrus Orange Ink in a Bottle for Tangerine and the other with a mix of Citrus Orange, Jubilee Red and Brazil Nut to make a Terracotta colour. I clear embossed them and cut them into tiny squares to create a Tessellated tile border. It's just finished with the dictionary definition and the vinyl Thicker coloured with silver (plus a bit of orange) alcohol ink to represent all the shiny silvery white metals ie. Tellurium, Tin, Terbium, Titanium and Thuliam! Hope you like and thanks once again for looking and leaving such lovely compliments. I'm struggling with time and inclination at the moment...and the heat isn't helping either. I know we shouldn't complain about the sunny weather but a little rain would be lovely too!! I love the little squares to make tiles. Very Clever. Lovely ATC Elaine. I agree more word choice seems to make it harder to chose a word (thats me now). I love the background turquoise and all the other 't' elements - you really do seem to study your dictionary and bring a group of words together beautifully. Wow! What a beautiful colour! Gorgeous tree too! 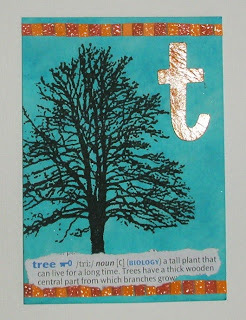 The tree stamp is beautiful and I love that shiny T! Well done for the 3 colours starting with T too.